However Improbable: "Was that your first kiss since 1945?" "No. I'm 95, not dead." "Was that your first kiss since 1945?" "No. I'm 95, not dead." Wherein Jack reviews The Winter Soldier. I thought I should write this once I was passed the BUCKY!!! stage...but I don't think that is going to happen. 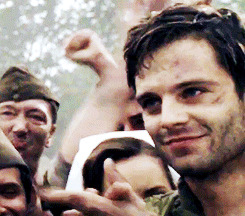 First of all, I loved Bucky in the first movie. I knew he was going to die - he was Rodgers' best friend. Rodgers was an Avenger. He was going to be in the Avengers movie. He was living in the 1940's, this meant he somehow made it to the future. Which meant his best friend was going to die. 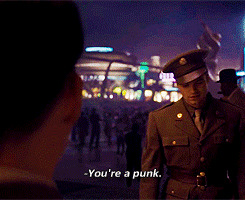 When this hit me I decided not to like Bucky, so I wouldn't be sad when he died. That lasted until he saved Rodgers from the bully and didn't yell at him for putting himself in danger. Nope, just saved his friend, pulled him up, and insisted they go out on a date with a couple of girls. 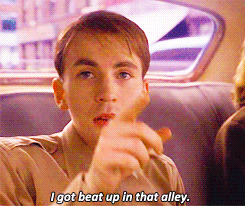 (I only liked him more when he told Rodgers he wasn't going to follow Captain America into battle, he was going to follow a kid from Brooklyn who couldn't walk away from a fight. 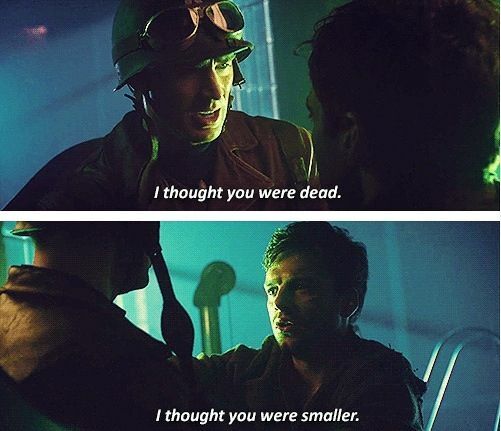 That was when I knew I loved Bucky. His friend was a hero, he took on a bunch of Hydra soldiers and saved a group of rag tag men. But that didn't matter to Bucky. What mattered was that Rodgers was still the kid from Brooklyn. The kid who stood up to bullies when he didn't have a chance at winning, and that was the hero Bucky was going to fight beside.) From that moment on I steeled myself for Bucky's death. It still hurt when it happened. Knowing the mysterious assassin was Bucky meant I wasn't knocked out of my seat when he took his mask off. But there were other things that surprised me, and everything else that didn't just made me happy - and sad. First...the Black Widow. She is too cool of a character to have such a dorky pose on the poster. I feel bad for her poster picture. I realized in this movie how much I like her. She was really cool in the Avengers. I liked her a lot in that one, but I liked her even more in this one. One reason is she is running around with a big, blond haired, gentlemanly superhero. Most girls would be swooning left and right, but there was no romance between them. (Someone might be able to imagine some in, but she was wearing an arrow necklace....so, I think it would take some hard imagining.) They were best friends, and they amused me. I don't have a picture for Natasha. So....I will do a quote. How is that? "Where did you learn to steal a car?" "Germany. And we're borrowing it, get your feet off the dash." Sam. I liked Sam when Rodgers was outrunning him and he was yelling, "Don't you say it!" I was happy he had such a big role in the movie...AND I WANT HIS WINGS!!!! My favourite part was when Sam tries to talk Rodgers out of trying to save Bucky. 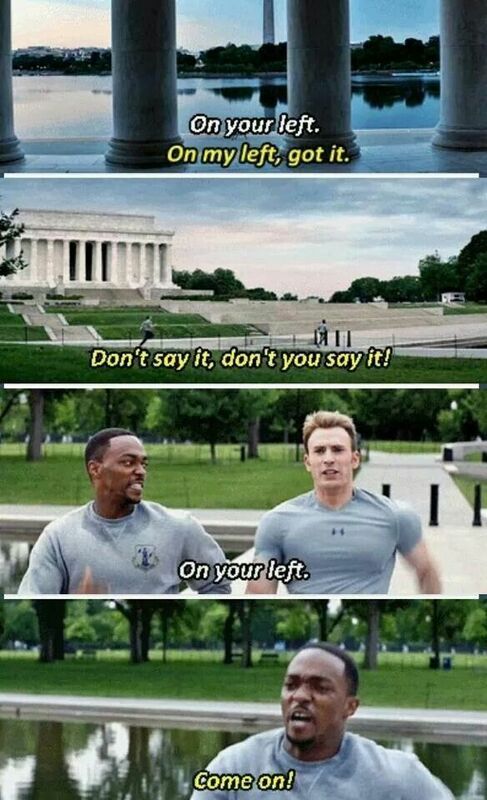 (I wanted Rodgers to save Bucky, I kind of yelled at Sam for saying that, but it was still a nice scene. I think, even though Rodgers is bigger than a lot of the men in the Avenger movies, everyone worries about him a lot. He has this little boy-ishness that never went away even after he was turned into a superhero and his friends just have this urge to protect him and look out for him. Even Bucky was doing it, after Rodgers saved him - he refused to leave the burning building even though Rodgers likely would have been fine on his own.) Sam was worried Rodgers would get hurt or killed if he tried to save Bucky and he didn't want to see that happen to his new friend. 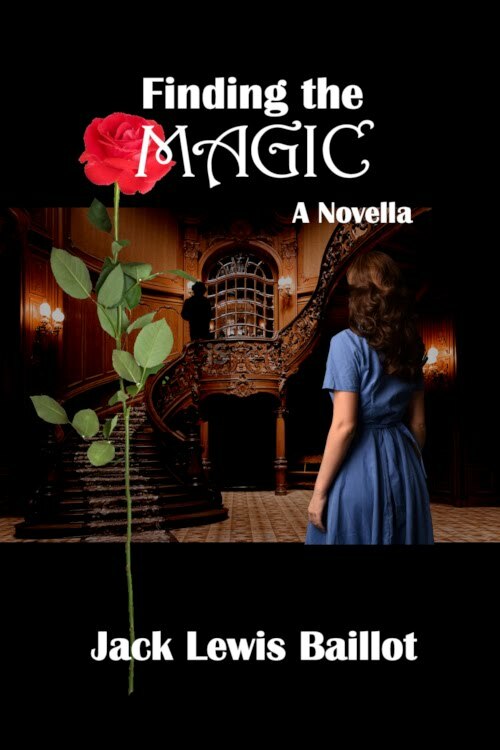 I sat through the last battle, gripping my chair, panicking that Sam was going to die. And the part where Rodgers is in the hospital and Sam is waiting by him, playing that one song he told him to listen to so he'd fit more into the modern world. That was one of the best happy moments. Because I don't want to do a Fury picture. "I just do what he does...only slower." The elevator scene was perfect. Just as wonderful as I was hoping it would be. It kind of reminded me of an elevator fight in Get Smart. They connect the movies with Agents of SHIELD!!!! I thought they would do it with this movie, it just made me especially happy when they did. I liked Nathasa and Rodgers on the run together. They were so awkward at trying to blend in and Rodgers' shoes were disturbing. The scene when Bucky catches Rodgers' shield!!!! I LOVED the crushed, baffled look on Rodgers' face! "But...but...that is MY shield. No one can catch MY shield! Give it back!" 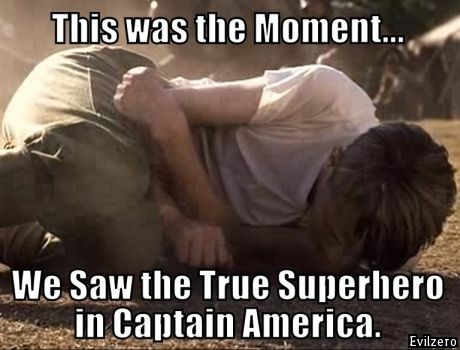 And when Bucky throws it at him he looks even more heart broken. "You...you just threw my own shield at me." The bridge scene. Even though I knew it was Bucky, I forgot how to breathe when Rodgers' saw. He looked so confused and panicked and then he was dazed.....yes, one of the worse scenes in the movie. When Bucky is asking about the man on the bridge and keeps repeating that he knew him and he sounds like a little boy. That one hurt too. The final battle was amazing and heart wrenching. I yelled at Rodgers when he beat Bucky, then I yelled at Bucky when he beat Rodgers up. (It is hard, liking them the exact same.) I then yelled at Bucky for just walking off after he saved Rodgers. He was starting to remember! The one person who could help him, and he leaves him lying on the ground half drowned. Okay, now to the best part. I think I am drawn toward soldier characters. And he is clueless about a lot of technology things and I love slightly clueless characters. (Hence Peter.) Also, he has cool boots. I know, I shouldn't be adding points for boots, but I do. He has a quirky sense of humor and can laugh at himself and admit when he doesn't know something. (Picking on Sam while they were running. Admitting he was still learning about 2014. His age joke when Natasha is picking on him about their kiss.) AND, even when his best friend took his shield, threw it back at him, tried to kill Natasha, tried to kill Sam, tried to kill him, tried to take over the world, turned into a brain washed assassin, he never gave up on trying to save him. 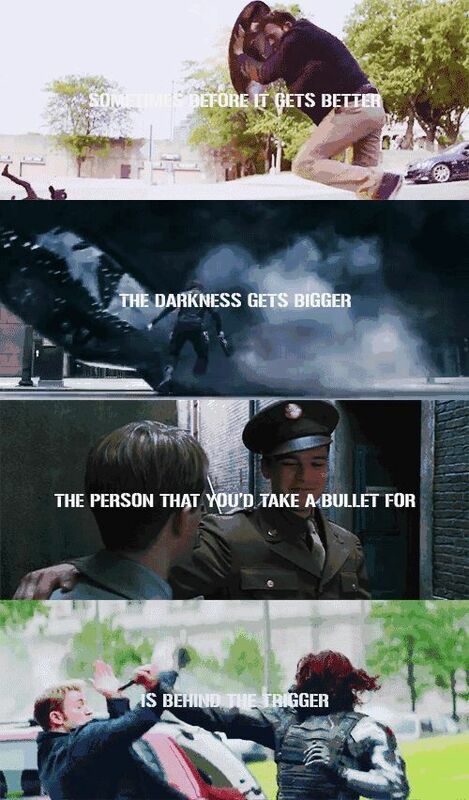 And, once he didn't have to fight Bucky to save the world he stopped fighting him because he couldn't hurt his friend. How, even now that he can run really fast and get shot and recover and has arms which could rip his shirts, he is still the same kid from Brooklyn who doesn't like bullies. The age thing. I don't know why, but that amuses me. I believe in the first Captain America, when eh was trying to sign up, his papers said he was 21. (Someone might know for sure.) Either way, I'm pretty sure he is now the oldest/ youngest Avenger. How he sassed his neighbor. I don't know why I liked that so much, but I do. Him standing up to Fury. Because...YAY!!!!! 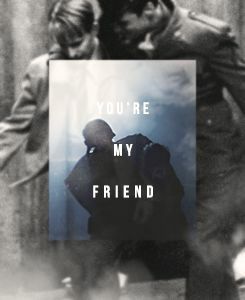 And....lastly, because he pulled Bucky's, "Because I'm with you till the end of the line," line. Okay...now we have got to the part where I am not allowed to explain all my feelings by shouting BUCKY!!!!!!!!!!! I don't even think that is possible. I didn't know Bucky was going to be bad, when I first realized he was the Winter Soldier. When I found out I was a bit worried, but still...he was Bucky. Something had to have happened. 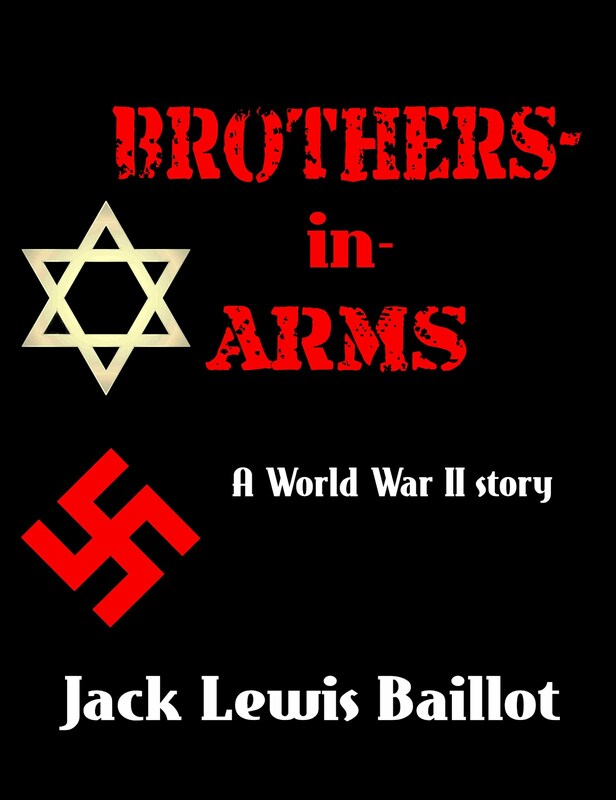 I didn't know he'd been brain washed and had his memory swiped, so it was worse than what I had been preparing for. I had it on good authority that the ending of the movie was hopeful, but I still was on the edge of my seat during the times when Bucky was on screen. I felt bad for him when he was with Hydra and talking about how he knew the man on the bridge, and I mentally yelled when they said to wipe his memory. The last fight scene was nail biting though. (As I mentioned above.) I still haven't got over that. But, I was a good Marvel girl and sat through the VERY end of the credits and saw the hopeful clip. That made me feel a little better. Now, whenever I talk about BUCKY!!!!! it is with a couple less !!! then if I had left before. All I know is that, after that, my friends and I have decided we deserve a BUCKY!!!!!! 8-D moment. Oh look, I found one "Was that your first kiss since 1945?" But...there it is. My best attempts at a review. Sorry for the spoilers, but there was no way around that. Go and see it if you haven't. It is Marvel, so it is fun. Grimmer than the Thor movies, but it still has light hearted moments. I get the impression you like Bucky. I don't know why Steve doesn't have more fans. He is wonderful and brave and everything you want in a guy. He is tied with Tony for favorite avenger. I love him and wish people would quite saying he is 'too good' or a 'fuddy duddy' It makes me mad. this was a fun review. You should do them more often. Honestly when I saw this in theaters, it had been a while since I'd watched the first one, so I had forgotten about Bucky (I feel terrible for that). 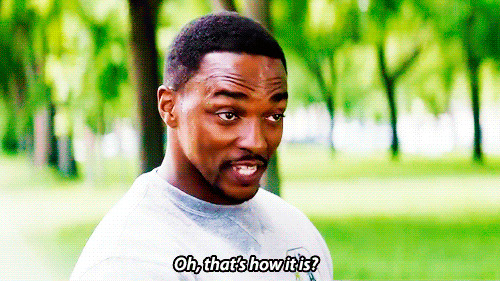 So when he took off his mask and Captain America was shocked and the whole theater was gasping, I was thinking, "This is a big moment. What am I missing here!?" Then as the movie progressed, I figured out who the Winter Soldier/Bucky was and I was like, "Oh. OH!" And when Bucky kept asking who the man on the bridge was, I was willing him to be quiet, don't let these people know you know, Bucky, you can figure this out. Agh! That part was so crunching. How can people be so unfeeling and ruin other people's lives like that? The elevator scene was awesome. :) I love how Rodgers says, "So before we get started, would anybody like a chance to leave first?" And yet there's only one of him and a ton of them. I like how he knows his own strength but he doesn't think too much of himself. He does still have that boyishness about him. Natasha's and his banter is so much fun. I like how they're just friends and remained just friends. That doesn't happen often anymore. I liked Natasha a lot. Usually people ruin female superheroes. They're either all, "I can handle it myself" and not feminine at all, or they're too feminine and will flirt with anyone. They can never work well in a team, because they're too selfish. But Natasha wasn't like that. I guess you could say, she wasn't insecure. Fury. Bleh. I don't know anyone who actually likes Fury. To him the end justifies the means. I do like how Rodgers stands up to him. Nobody likes Fury but everyone's too scared to stand up to him because Fury's paranoia makes him powerful. Everyone except Rodgers. :) That's what I like about Rodgers. To him doing the right thing is what matters most. And not because he wants to be higher and better than others, but because it's the right thing to do, no matter the cost. I think Bucky left mostly because he was still confused. And if what he was beginning to realize was really the truth, it would hurt to think that he had been hunting his best friend. That he had worked for those people, that he had killed so many innocent people and was on the edge of killing masses more. That he had been fighting on the wrong side. Sure he didn't know it. But it would hurt to know that someone had manipulated your mind and used you for evil without you even realizing it. And facing Rodgers again would mean facing all of that. And of course Rodgers would help him and forgive him. 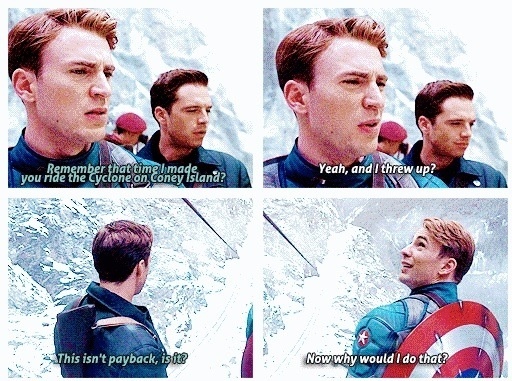 But Bucky would've been really ashamed of what happened. That's the only explanation I can think of. . . It would literally take me an hour to discuss everything you said, so let's just shorten it and say YESSSS!!! Literally every sentence you said was my EXACT feelings, down to Natasha's hair! Everything! I loved it! BUT ALL THE FEELS!!! Speaking of getting emotional of fictional characters... Right? I knew Bucky was going to die, but only after I started the movie, because Captain America came out before I was an Avengers stalker. lol. So I was like, "But this guy just saved Steve and ohmygosh he looks good in a uniform, and jeeez, he called him a punk.... GAH he's so nice! WHAT? NO! Bucky was in the 107th!! BUCKY'S ALIIIIIVE. Bucky's all hurt. Bucky's going to follow the kid who got beat up all the time. BUCKY IS DEAD! OMG NO NO NO NO NO NO NO NO." 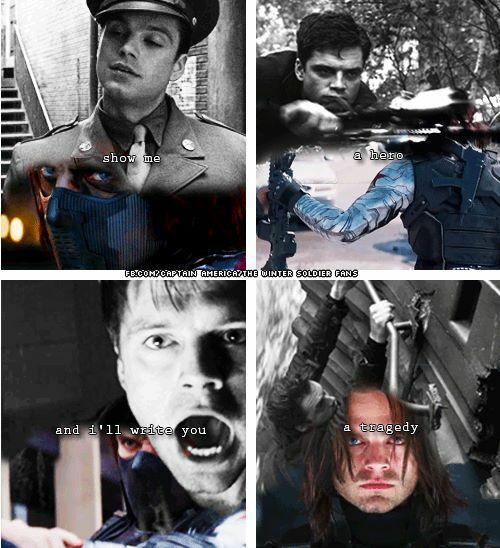 And those were my someone edited feelings about Bucky. I don't know why I'm retelling you all this, you already know. lol. I don't think Fury is as bad as Conner. Conner kills innocent, sick little boys, and Fury.... well he's not *that* bad. lol. The elevator sceeeeeennnnne. STEVE WAS SO AWESOME. SO MUCH AWESOME I COULDN'T COPE. I'm glad they worked it in with SHIELD because it made SHIELD so much more intense. I loved Steve (in the first movie) Right off. He was brave, he was trying so hard to serve his country, even if he was a scrawny little man. But the part where he jumped on the grenade, and I was like, "I WOULD MARRY HIM AS IS." lol!!!! I am really, really tired of people calling Cap a fuddy-duddy, lr a boring character, or not... awesome. I get all irritated, because he's not any of those things, he is just old fashioned and I love him for it. People act like being a naturally good person is boring, but honestly, who wouldn't rather have a good man over a "bad boy" crack head? lol. 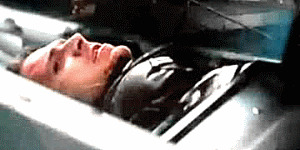 "Mad Bucky" gif is aaawesome. I can't go on, because this comment is already ginormous, but I will say that YES YES YES, I agree with everything. HE HAS TO SAVE HIM! HE HAS TO SAVE BUCKY!! HOLY CRAPPUCCINO. THIS MOVIE. BUCKY. STEVE. SAM. NATASHA. BUCKY. One does not simply move pass the BUCKY!!! stage. Not ever. Actually, I'm pretty sure he's my favourite Marvel character now. And I'm just gonna say he's not a villain, he's a tool of destruction—an asset of villains. Just for clarification. I love Steve and Natasha together. They're bloody hilarious. "I'm here to pick up a fossil." "'Public dispalys of affection make people very uncomfortable.' 'Yes, they do.'" And Natasha's multitasking skills. Gah. Definitely a brOTP. And Sam with both of them. "I made breakfast, if you guys eat that sort of thing." Oh. The Random Neighbour Agent Woman. Did they ever mention her name in the movie? I can't remember, but she's Sharon Carter, Peggy's niece or something. Speaking of Peggy, that scene with her killed me. Not as much as the "But I knew him" scene, or the "I won't fight you" scene, but yeah. I have a feeling that Bucky using/catching Cap's shield in the first movie and this one may or not be foreshadowing to a spoilery thing. Also, Sebastian Stan has a 9-movie deal with Marvel. And Chris Evans only has 6. I love this movie so much. Everything was so well done. I even liked Fury. And the fight choreography was a work of art. Gah and ack. And the ending was great. (You stayed 'till after the credits, right?) It was all so good. Especially Bucky. I loved this movie!!!!! :P But I didn't like his neighbor...she's the girl from Revenge. Bleh. A commercial for that show seriously used tthe word "revengier." Sigh. But Captain America is the best Avenger! 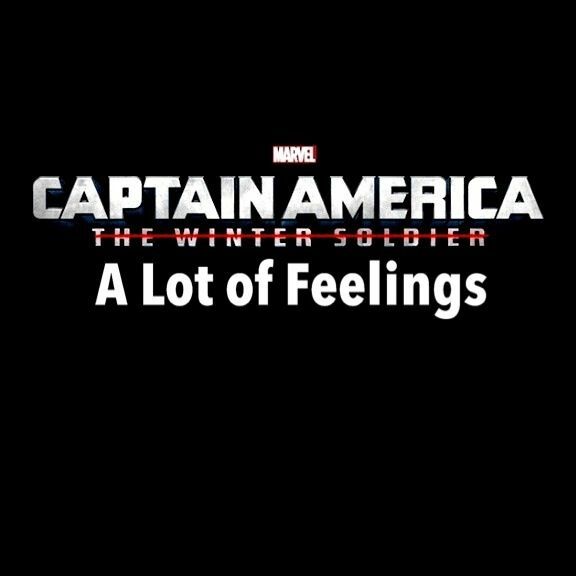 Haha, "Captain America: A Lot of Feelings" is the perfect name for the movie! Also I like the quote that you used for the title. That was a great one! Captain America has been my favourite super hero since his first movie. I like that the whole *point* of him is that he is a good man. He was a hero before he was a super hero. And I like the way he makes it cool to be an old-fashioned gentleman. I enjoyed Winter Soldier more than I thought I would. They did *not* modernise rogers, which I am always afraid they will do. Fury is also on my black list for what he did to coulson, but I did feel a wee bit sorry for him for a bit in this movie - although, I was back to being angry when I watched the next Agents of SHIELD. 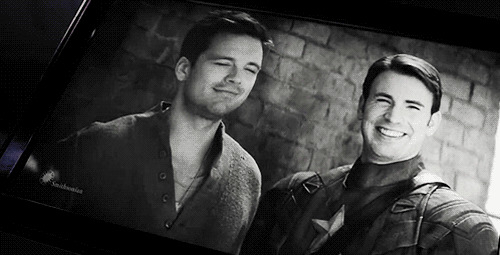 I was so happy that Rogers stood up to Fury, that was cool. To my huge surprise, I actually ended up liking Maria Hill in this one. Normally she sort of gives me a pain. 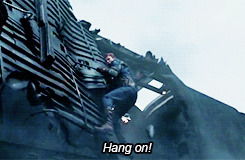 I also really like the fact that, messed up as Bucky is, that friend of the little kid from Brooklyn is still there - from Pierce needing to tell him that he is doing good things for the world, to his inability to just walk away and let Steve die, something is still working the way it should in the poor, broken man. I thought it was one of the rare times when the sequel was far far better than the first movie. Having seen a lot of the cartoons, I went into the movie knowing exactly who the Winter Soldier was and what had happened to turn him into that... so, no surprises there. I felt like they did a good job with it though - definitely an "AHA!" moment for those who didn't know it was coming, and still quite compelling for those who did. I think my favorite Marvel Superheroes movie still has to be The Avengers, followed by Thor (the first one), and Iron Man 1, and this one might quite possibly sneak into 4th place. I'm not sure. That would be saying rather a lot because the shaky cam/dark-lighting/camera-angle-switching-constantly combinations really annoyed me (but the plot and dialogue and acting may have made up for the poor camera work... I have to see it again to be sure). 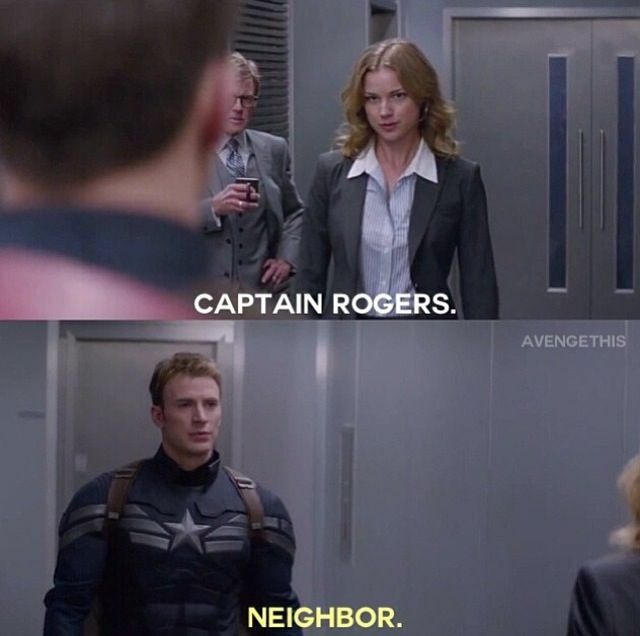 Just FYI (and I hate to nitpick) it's Rogers, not Rodgers. Great review of a fantastic movie!